In this guide, we analyze the most comparable models from each brand to help you decide. 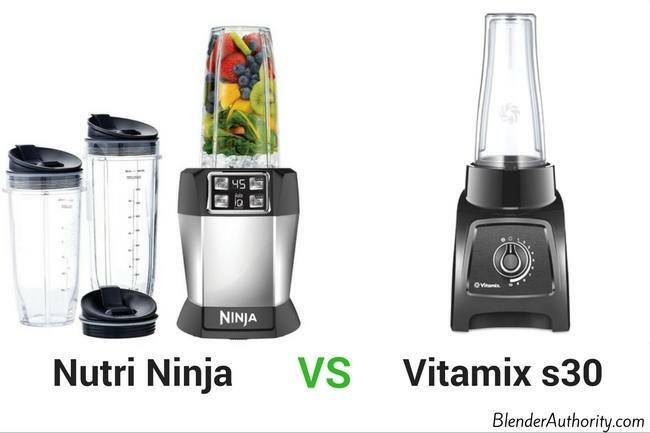 First let’s point out the main differences between Ninja and Vitamix blenders. Warranty : Up to 10 year full warranty. 1 year limited warranty. Accessories : Various blender container sizes for wet and dry ingredients. Variety of jars, blades, and food processing accessories. Can Blend Hot Liquids : Yes. Powerful enough to turn cold ingredients into hot. Not recommended. Warranty Support : Best in industry and free repairs. Limited warranty. Blending Performance : Award winning performance. Used in professional kitchens. Decent performance depending on model and blade used. Yes, Vitamix is priced 2-3x more than a Ninja blender so you have to consider cost when fairly comparing the two brands. Vitamix is better made and will last longer even with frequent use. To be fair though, Ninja has sold millions of blenders and they do make decent blenders for the price. Vitamix offers a full warranty up to 10 years depending on the model and they even pay for shipping if you make a warranty claim. Ninja blenders offer a one year limited warranty. Vitamix blenders are made in the USA and known for quality. Their blenders are made with long lasting motors and components. Vitamix blenders have been used in high-volume professional kitchens for decades and the brand has a passionate, loyal customer following. Ninja blenders are made in Asia with more plastic components. Ninja products are definitely made more economically than Vitamix, but they aren’t necessary bad. Despite the difference in quality, some of the Ninja blenders have similar power to Vitamix and can easily handle popular blending tasks such as making frozen drinks and smoothies. Ninja really targets the mass market with their price points and they continue to be a top selling blender line. Overall, Vitamix will outlast most blenders including Ninja so you pay more for that quality. Ninja offers more choices for power, features, and price points with their blenders compared to Vitamix. Vitamix really just focuses on the full-size high powered blender market. Also, Ninja offers more accessories for their blenders to do other tasks besides blending such as food prep. 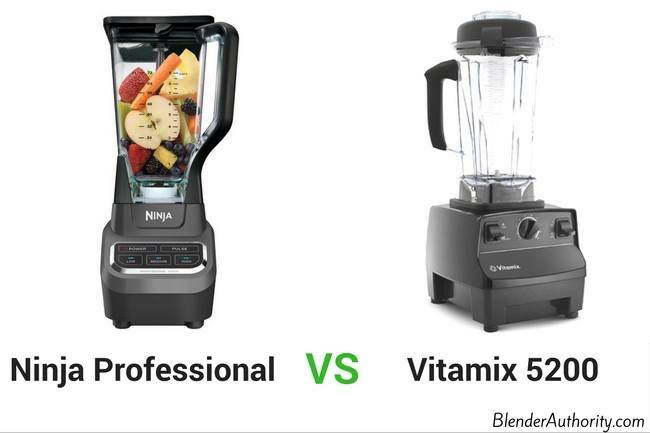 Assuming you compare models with similar power, Vitamix will usually edge out any blender for performance including Ninja. Ninja does perform well and can meet many users needs for everyday blending but Vitamix motors provide consistent torque and strength to blend even the most difficult ingredients. There are so many models between the brands that it’s hard to definitively say one brand is easier to use than the other. Both brands have been adding more electronics in recent years to make blending more hand-offs like pre-programmed blending modes, digital controls, electronic container recognition, and more. Vitamix is known for its simple controls and popular variable speed controls. Ninja recently introduced their own variable speed control dial on new models and consumers like Ninja’s preset blending programs called Auto IQ. Ninja’s locking lid (on models with the total crushing blade) can be cumbersome sometimes but it is a safety feature. Both brands are easy to clean although some models don’t have dishwasher safe containers so read the instructions for the blender model your choose. Personally, we would just rinse with warm water and soap rather than a dishwasher. On newer models, each brand now offers a preset “Cleaning” mode that you use with warm soapy water. How frequently will you be blending ? How large of portions will you typically make ? How much space do you have in your kitchen ? 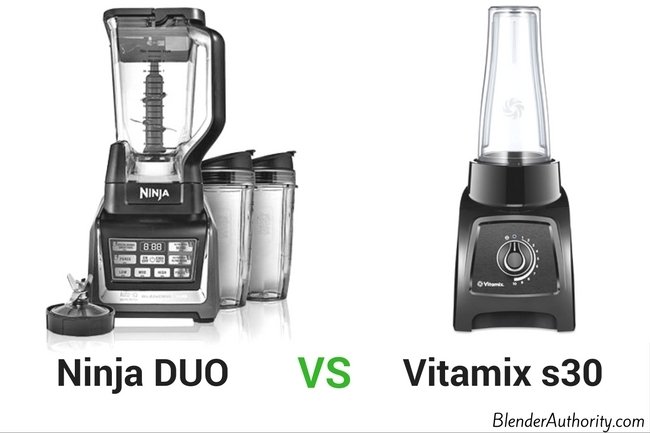 Now that you have a general idea of the main Ninja and Vitamix differences, let’s get into a comparison of the popular models. First up in the comparison is the Vitamix 750 vs Ninja Mega 1500. Vitamix G series blenders are “Next Generation” blenders(Models 7500, 750, 780) that use Vitamix’s new 2.2 Horsepower motor and design. The Vitamix 750 is the most similar to Ninja for comparison purposes because of the preset controls. Features: Both blenders have preset blending modes but the Vitamix also has a more useful variable-speed dial which the Ninja Mega does not. With the Ninja Mega you have 3 preset speeds, pulse button, and single serve button. A benefit of the Ninja Mega is that it includes their personal blender blade and containers for small portions which is a really nice feature. A negative of the Vitamix G series blenders is they can struggle blending small portions properly so you might need to buy another Vitamix container for small portions. Performance: Ninja’s popular Mega 1500 Kitchen System blender has 1500 watt 2 horsepower motor. While the power seems similar, the Vitamix 750 will blend finer than the Ninja Mega because of the blade design and torque of the motor. Ninja uses their Total Crushing blade which is a series of vertical blades versus all Vitamix blenders use a traditional blade at the bottom to pull the ingredients down into a vortex. The performance difference between the two might not be noticeable with some ingredients but the Vitamix will perform better in pureeing tougher ingredients like kale, celery, frozen fruits, and carrots. The quality and performance of the Vitamix 750 is better. Also you get a full 7 year warranty with the Vitamix vs Ninja 1 year limited warranty. The Vitamix 750 costs about 4x the price of the Ninja Mega so it is a big difference. The only real negative on the Vitamix 750 is that the wide jar doesn’t do small blending batches very well so some users buy an extra, smaller Vitamix container. The Ninja Mega offers pretty good performance and power at a much lower price but the blending quality is not as fine as the Vitamix. It is a good smoothie blender and will blend well for recipes that use liquid. The Ninja Mega 1500 can do difficult tasks like making dough but the Vitamix will perform better overall and is designed to last longer with frequent use. One benefit of the Ninja Mega is the option to have a food processor bowl and personal-size smoothie cups. Side Note – You can get a factory reconditioned Vitamix G series for less if price is a big issue. If you are going to be an active user and blending a wide range of ingredients then it is worth paying more for the Vitamix 750 for durability. If you just want an affordable high-powered blender that works well for blending smoothies, crushing ice, and basic blending tasks then the Ninja Mega is a good option for getting started. TIP – If you don’t care about the food processing components of the Ninja Mega Kitchen system then take a look at the new Ninja Chef below which is the closest competing model to Vitamix that Ninja offers in 2019. -> Click Here for Ninja Mega Current Price . -> Click Here for Vitamix 750 Current Price. The Ninja Ultima was Ninja’s first main attempt to make a professional blender to compete with Vitamix at the high-end market. The Ultima offered a powerful 2.5 peak HP motor and Ninja’s first variable speed dial which is a very popular feature on Vitamix blenders. The big differentiation that Ninja Ultima advertised was its dual-stage blending that used a unique gear system to blend the ingredients in stages. Also, the Ninja Ultima performed well in head to head tests with Vitamix for blending performance and had excellent reviews. But….Ninja discontinued the Ultima in 2017. It never came out with a new model that uses that same dual stage motor, but in late 2017 Ninja introduced their new Chef blender which we review below…. The Ninja Chef blender CT805 was introduced in 2017 and is the brand’s main competing model to Vitamix blenders based on design, features, and power. The Chef has a 1500 watt motor with Ninja’s new bottom blade design and they got rid of the vertical total crushing blade tower that is common on other Ninja models. In our Ninja Chef review we mentioned the similarities of the Ninja Chef to new Vitamix models with variable speed knob, LED control panel, smart jar recognition, 4 prong bottom blade, and tamper. The Ninja Chef is marketed as a blender for serious cooks who want to use their blender for a wide range of foods not just making smoothies. Since its introduction one year ago, consumer feedback continues to be good for the Ninja Chef. Although, there are not any independent long-term durability tests using the Chef blender CT805 or CT810 models so there are some concerns about longevity as the blender has a lot of plastic parts. The Chef is priced much lower than any Vitamix model but again the Ninja only has a 1 year warranty compared to Vitamix 7 or 10 year warranties. The Chef is a powerful blender with Ninja’s latest innovations. It is powerful enough to handle most tasks and is well priced. Thousands of users have done difficult tasks like making dough, soups, and nut butters with weaker Ninja blenders so the new Chef should be fine for many users. We do have a couple concerns with the Chef blender models: (1) There are some complaints about a burning rubber smell and (2) The gear drive is plastic which is not ideal for a blender marketed for heavy use. Despite these concerns, overall reviews continue to be good for this blender. If you want a heavy duty blender that is designed for frequent use for any task then go with a reliable Vitamix which has a longer warranty and quality components. Difficult blending tasks like nut butters, dough, and thick recipes can cause many blenders to overheat and wear out the motor. Vitamix is specially designed to handle these tasks and is built for heavy use. For Vitamix models to consider, take a look at the popular classic Vitamix 5200 or the newer Vitamix 7500 or Ascent A2500. See our summary about “ Which Vitamix to Buy ”. The Ninja Professional is continually one of Ninja’s best-selling countertop blenders. The Vitamix 5200 is Vitamix’s classic blender that ranks at the top in many independent blender tests. While these two blenders have been mentioned in various Ninja vs Vitamix comparisons it should be noted that the Vitamix 5200 costs 4x the Ninja Professional. The Vitamix 5200 has more power at about 1400 watts and will outperform the Ninja Professional 1100 watt motor. 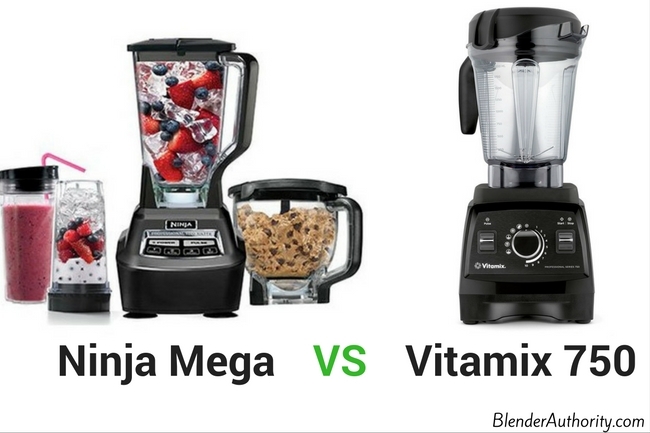 The biggest difference is that Ninja uses their Total crushing blade compared to Vitamix’s 4 prong blade. The Vitamix blade will pull the ingredients down into a vortex for consistent blending results. Whereas, the Ninja total crushing might struggle with pureeing certain ingredients since it doesn’t pull the ingredients down. For features, the Ninja Professional has a 72 ounce container versus Vitamix’s 64 ounce container. The Ninja uses preset blending programs for adjusting speed whereas the Vitamix 5200 has their popular variable control dial. The price difference is dramatic between the Vitamix 5200 and Ninja Professional. 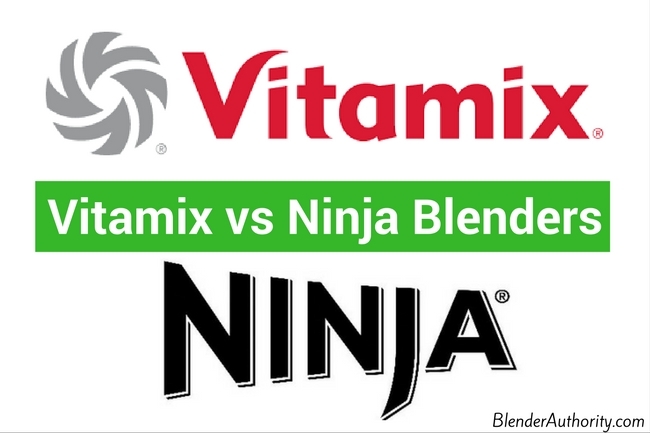 The Vitamix will outperform the Ninja Professional for blending results. The Ninja Pro blender though is extremely popular with strong reviews and is an affordable blender for making frozen drinks and smoothies. If you don’t have the budget for the Vitamix 5200 but want more power than the Ninja Professional then take a look at the new Ninja Chef (see review above) which is similar to the Vitamix 5200. -> See Current Price for Vitamix 5200 NEW or Refurbished. The Nutri Ninja is Ninja’s popular line of personal blenders. The models range in power and features. Vitamix’s personal blender line is called the S-Series blender. The base model line of personal blenders from Ninja is called the Nutri Ninja Pro (BL450 / BL451 / BL455 / BL456). The Nutri Ninja Pro doesn’t have any controls and uses a 900 watt motor. The next level up is the Nutri Ninja Auto IQ (BL480 / BL481 / BL482) personal blender line which uses a 1000 watt motor and offers preset blending functions. For even more power there is the Nutri Ninja Auto iQ BL490 with 1200 watt motor and top loading pitcher. For comparison purposes let us look at the the base model Vitamix S30 vs the Nutri Ninja Auto IQ BL482 . Features: The Ninja Auto IQ has a 1000 watt motor vs Vitamix s30 has a 790 watt motor. The Vitamix comes with a 20oz and 40 oz container with 10 speed variable control and pulse. The Ninja has 320z, 24oz, and 18oz containers with 2 pre-programmed blending programs and pulse button. The Ninja has a 1 year warranty vs Vitamix’s 5 year warranty. Performance: Both blenders have a similar 4 prong blade that pulls the ingredients down into a vortex so blending results won’t vary dramatically between blenders. Both have motors with plenty of power for their container sizes. Vitamix S30 Thoughts: A unique positive for the Vitamix is the variable speed dial which is nice for food prep but not necessarily needed for smoothies and pureeing. The other Vitamix positives are the longer warranty and overall quality. Nutri Ninja Thoughts: Plenty of power for making smoothies and normal blending but doesn’t have the variety of speeds that the Vitamix S30 offers. Users like Ninja’s Auto IQ hands-off blending programs but you should understand that Auto IQ is just a timed program and doesn’t know what ingredients you are blending. This means that you might have to blend longer than the program runs depending on the ingredients used. You would use the pulse button for chopping and food prep where you don’t want to puree the ingredients. The Vitamix S30 is well built but the price can be hard to justify for a small capacity blender as it costs as much as a full-size refurbished Vitamix 5200. The Nutri Ninja will provide similar blending performance at a lower cost but realize that it might not last as long as the Vitamix. Overall, in deciding on the Vitamix S30 vs Ninja personal blender we would just go with the Nutri Ninja for making smoothies because of price and you could always just buy a cheap extended warranty if you are going to be a frequent user. The Vitamix S30 is excellent quality and perfect for small portions and small spaces but we think a full size high-powered blender will offer more versatility for a similar price. -> Click Here for Vitamix S30 Current Price. -> Click Here for Nutri Ninja Current Price. We compared the Nutri Ninja personal blender above but another comparison is the full-size Nutri Ninja Duo vs Vitamix S30 because both offer a top loading pitcher and single serve container. The Ninja DUO blender is a full size countertop blender that also works with their Nutri Ninja single-serve cups. Features: The Duo is larger than the Vitamix S30 and comes with various containers – Full size 64oz pitcher and 3 Nutri Ninja cups(18oz, 24oz, and 32oz). The Vitamix S30 is more compact and comes with a 40oz pitcher and 20oz personal smoothie cup. Performance: The Vitamix S30 matches Vitamix’s reputation of consistent blending and reliability. The S30’s variable control knob allows nice versatility for blending different ingredients. The Ninja Duo pitcher uses their total crushing blade which can struggle with some ingredients because it doesn’t pull the ingredients down into a vortex like a conventional blender. The DUO does pretty well with smoothies, frozen drinks and recipes that use liquid but not as great with dry recipes. In head-to-head comparisons, despite the lower power, the Vitamix S30 will provide better results because of the blade and pitcher design. In comparing the Vitamix S30 vs Ninja Duo, the Vitamix will generally outperform in head-to-head tests for a range of tasks but the Vitamix does cost twice as much. The Ninja DUO pitcher works pretty well for recipes that use liquids and the Nutri Ninja Cups blend better than the pitcher. The negatives on the Ninja DUO are the reliance on Auto IQ programs which don’t account for amount of ingredients you are blending and the total crushing blade can be inefficient with dry ingredients and recipes without liquids. The negatives on the Vitamix are that it is expensive and limited in capacity. The user reviews are quite good for the Ninja DUO but there are other alternative Vitamix blenders worth considering if you want a full size blender. The Vitamix s30 can be expensive for a small blender but it does provide excellent performance as well as dual containers. As mentioned earlier, if you don’t care about size then we would go with a full-size Vitamix which has more power, versatility and is close in price to the S30. With frequent use Vitamix blenders will last longer and provide a consistent blending performance over time but you pay more for that quality. For choices, take a look at our favorite Vitamix Models. Whereas, Ninja blenders provide good blending power at a lower price but they are built more economically and won’t last as long with continued use. If you are on a budget then a Ninja blender can be a good option and you can always get an extended warranty for peace of mind. If you have any other Ninja versus Vitamix model comparisons that you would like to see then please leave a comment below. Loved your indepth reviews on the different models. I have a question for you. I just ordered the Ninja Intelli-Sense Kitchen System with Advanced Auto IQ from Costso. It comes with the slicer/shredder parts. I also wanted the spiralizer but to have both, I would have to order the $299 package from Ninja. Costco’s was on sale for $129.99 online only. I currently have the Ninja 1500 Professional Mega System BL770. It did not have either accessory — the slicer/shredder nor the spiralizer. So I thought I would buy this one. I called Ninja to see how much the spiralizer accessory would cost. They told me it would not work with the one from Costco. What would you advice? (I am giving my BL770 to my daughter — it is almost new and I know she can utilize). I just hope I am not making a mistake in not keeping since the hp is 1500 on the BL770 vs. the new one which is 1200. That seems strange they told you that as their website shows that the Spiralizer bowl does works with the CT680W model which I believe is the same model as Costco(They have different models for each store but they are the same blender CT680A / CT680SS / CT680W). Here is the link: https://www.ninjakitchen.com/parts/0/all/2361/spiralizer-bowl/?modelNumber=CT680W. Regarding the power. Both the Intellisense blender and the BL770 use the same capacity containers for blending and food prep so both blenders are designed with handle similar loads. You might notice a slight difference in power but it should not be that noticeable. I would call Ninja again. The Kitchen system means it should work with the spiralizer unless there is something specifically about the Costco model that prevents the blender Intellisense program from recognizing the Spiralizer. This is what I found: Auto-Spiralizer™ Kit is compatible with CT682SP and CT680W models only. Not compatible with CT680, CT641, CT640C, CT680SS, CT680A, or legacy Kitchen Systems. For those units, we recommend our stand-alone Ninja Precision Processor™ with Auto-Spiralizer™ (NN310) sold separately. Thanks so much for the follow up information Maria. Vitamix with the necessary attachment, or Ninja? I will also use the blender for general uses. Any suggestions? Both blender brands can grind nuts but the Vitamix will excel at more food prep activities especially heavy tasks like making Nut butters, turning raw vegetables into hot soups, making dough, ecetera. If you are looking to do a wider range of food prep tasks as well as blending then get a Vitamix. If you are a budget a reconditioned Vitamix is an amazing value and will last a very long time. 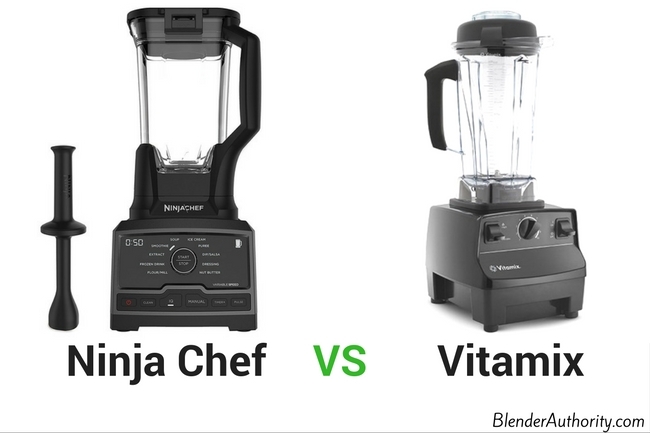 Really informative comparisons between Ninja Chef and Vitamix. The only thing that is missing would be the decibel /noise level between the two blenders. Yes the Ninja Chef is louder compared to the Vitamix. All high speed blenders including Vitamix are loud but Vitamix has better noise dampening in the motor so it isn’t as loud. The Ninja Chef works pretty well but for a little more you can get a refurbished Vitamix which is quieter and will perform better over time. Vitamix blenders claim to make ice cream does the ninja auto iq 1500w have the same facility to make ice cream? Hi GiGi, while both Ninja and Vitamix can make ice cream, the Vitamix will make creamier, better quality ice cream with a nicer consistency. Ninja blender takes a little more technique to get ice cream to the way you want it. It is due to the blade design and also that Vitamix has a tamper.